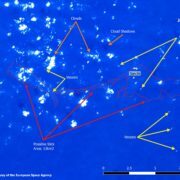 The data and analysis presented in this paper have been the result of a long-term collaboration between researchers at SkyTruth, Global Fishing Watch, Google, and universities in the United States and Canada. 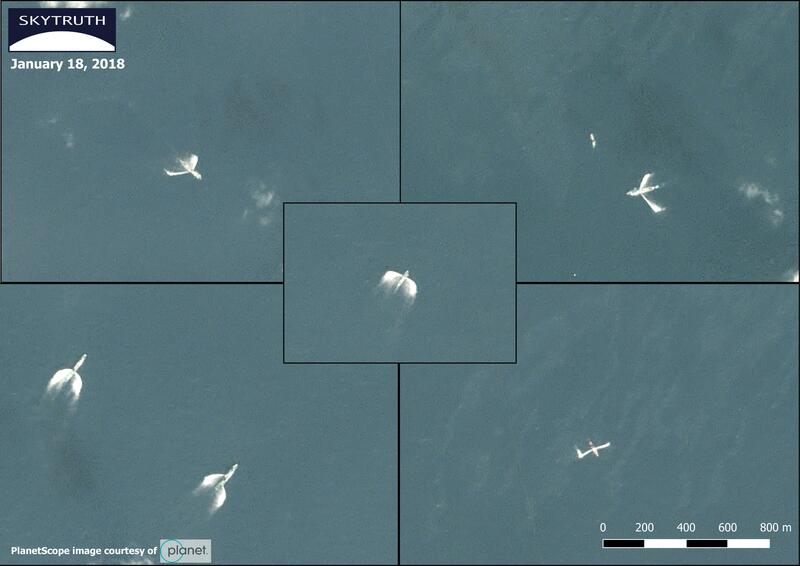 The research has been led by David Kroodsma, research program manager at Global Fishing Watch. 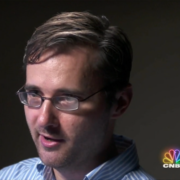 Other authors from the GFW and SkyTruth teams are Paul Woods, CTO of GFW, Nate Miller, SkyTruth research analyst, Tim Hochberg, machine learning engineer at GFW, and myself, an analyst at SkyTruth. 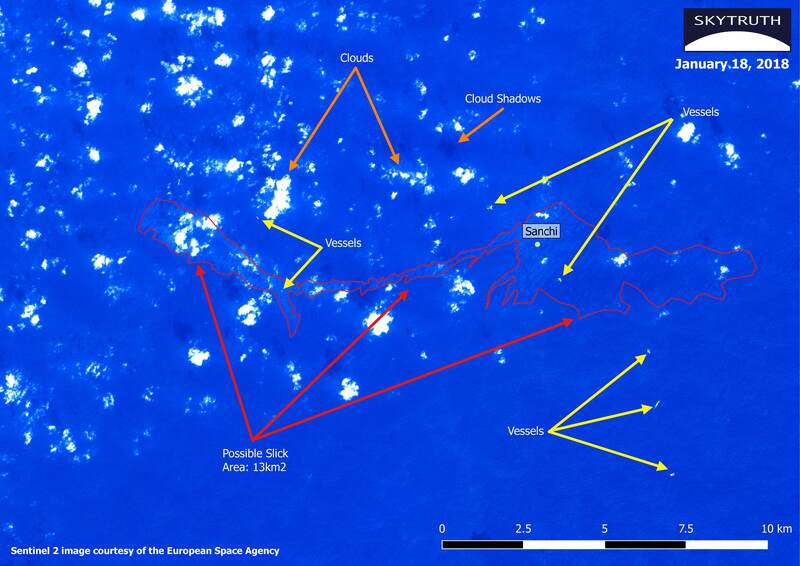 Along with other academic researchers we have worked to characterize the population of vessels broadcasting AIS and to assess the limitations in AIS coverage and reception. 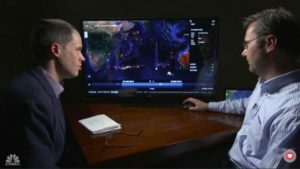 Central to the work being presented is a description of the data pipeline and modeling used to process the vast quantity of AIS data broadcast by the over 70,000 vessels now tracked in Global Fishing Watch. 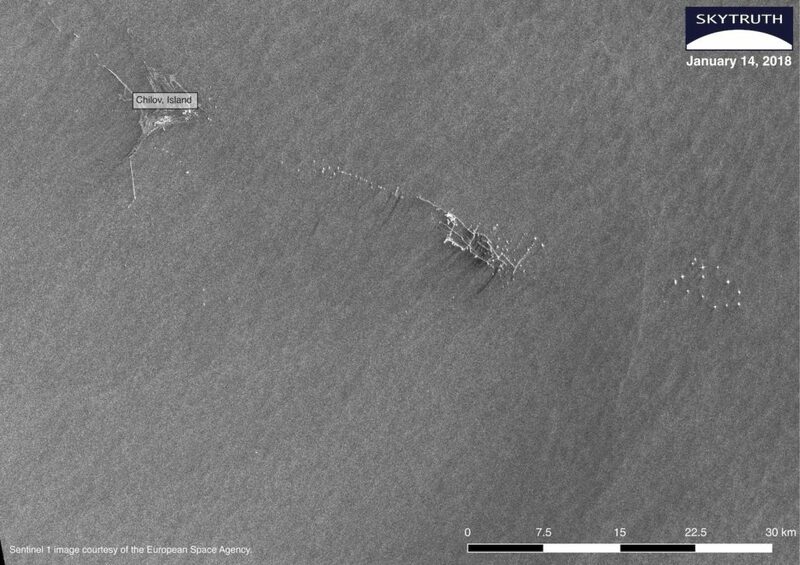 Machine learning was used to classify the tracks of these vessels and infer both where they were fishing and what type of fishing gear they were likely using. Based on vessel movements, models could even predict vessel characteristics like length and engine power. The temporal and spatial precision of this new global fishing effort dataset highlighted some surprising regional variations. Weekends are often taken off by fishermen in Europe and North America. This is not the case on the Chinese coast where fishing is only interrupted by the Chinese New Year and a summer fishing moratorium. 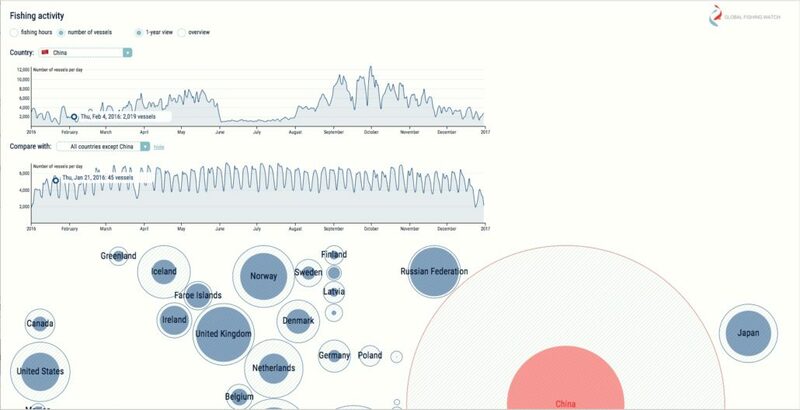 This can seen by comparing Chinese and non-Chinese fishing vessels in this data visualization from Global Fishing Watch. The most distinct spatial patterns of fishing effort can be seen to result from differences in regulation. More subtle effects are seen from variables like sea surface temperature and net primary production. 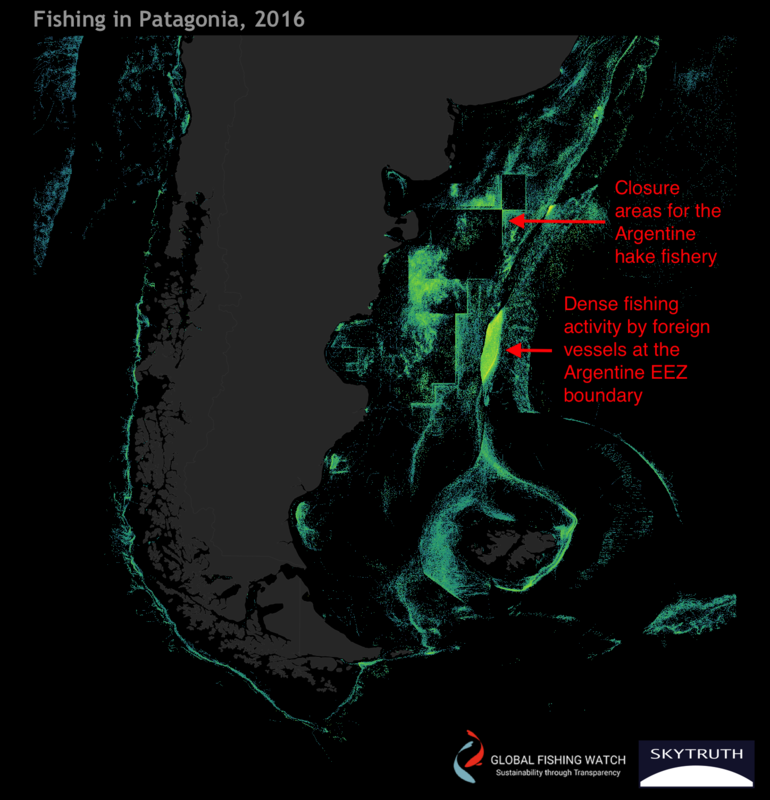 Below, you can see 2016 fishing effort off the coast of Patagonia, which shows both intense fishing activity by foreign vessels just outside the EEZ boundary and a checkerboard pattern within the EEZ due to Argentine regulation of the hake fishery. 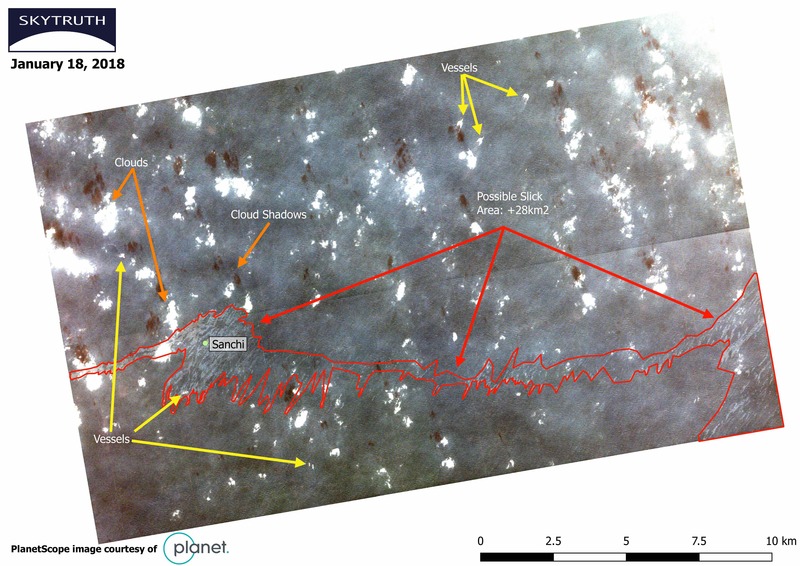 The data appearing in the image above is part of the public dataset that is being released along with our paper. Researchers can select maps for different regions or fishing gear types and also download the raw data underlying the images. To learn more about the study and to access the data, click here. This publication and data release is a milestone for our analysis of the global AIS dataset for fishing vessels but we still have a lot learn about the patterns of vessel movements we have characterized here. 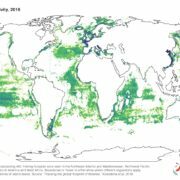 We hope our work can spur an increase in the use of AIS tracking data for fisheries research and regulation and we look forward to working with more partners to better understand this new data resource for marine conservation. The Oil Rocks (Neft Daşları) is a massive offshore oil complex in the Caspian Sea. The complex was constructed in the late 1940’s by the Soviet Union and has been producing oil consistently since 1951. The area around the Oil Rocks has experienced catastrophe in the past, when a fire at a nearby platform was responsible for the death of 32 workers and a particularly nasty oil spill in December 2015. As part of SkyTruth’s Watchdog program, we keep an eye on locations such as this. 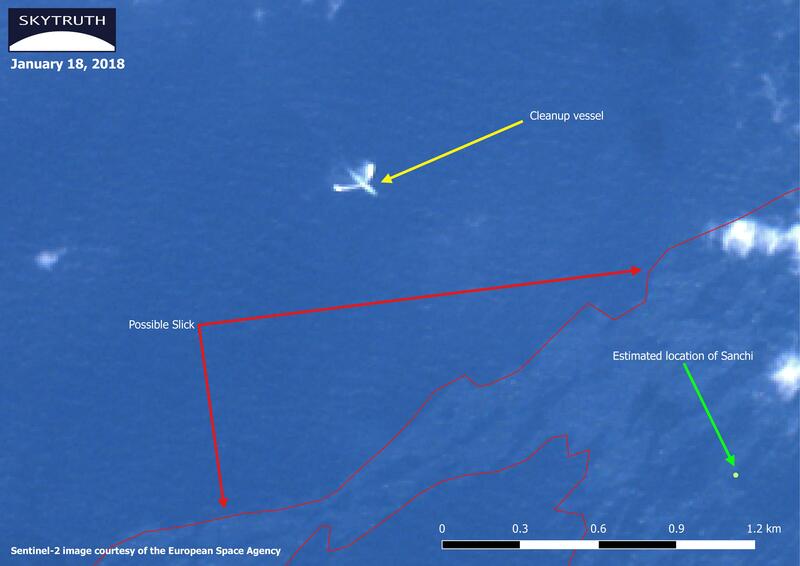 Over the past 2 months, we estimate that over 380,000 gallons of oil have leaked into the Caspian Sea, based on our assumption that the slicks we are observing are 1 micron (1/1000th of a millimeter) thick. Above: The European Space Agency’s Sentinel 1 radar satellite captured this image on December 9th revealing a 306 square kilometer oil slick surrounding the Oil Rocks complex. 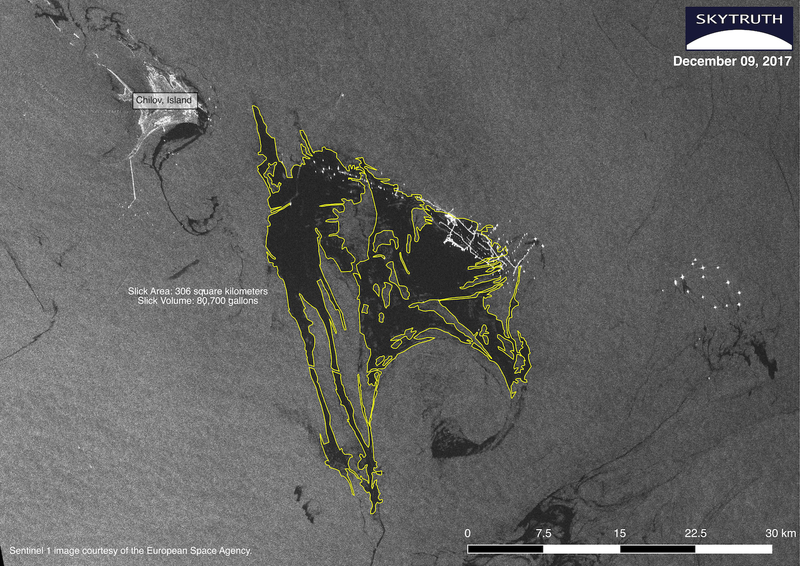 Above: Sentinel 1 collected this image of the Oil Rocks with a much smaller oil slick (23 square kilometers) on December 21, 2017. Wind speeds in the Caspian Sea were as strong as 35 knots toward the south on December 21st and may have dispersed an additional volume of oil on the water’s surface. 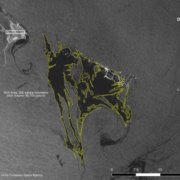 Above: Sentinel 1 imagery from January 7, 2018 reveals the Oil Rocks leaking oil. The slicks cover a total area of 34 square kilometers. 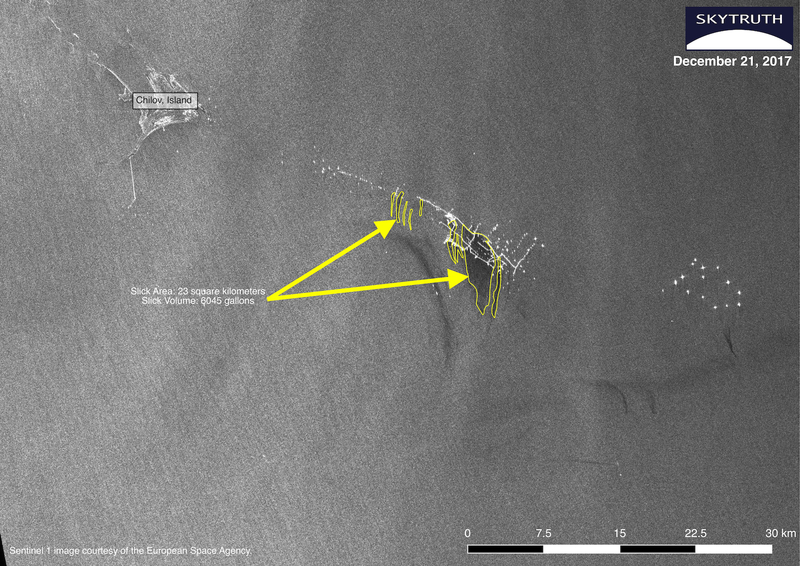 Wind speeds were very low (between 0-15 knots) on January 7th heading southward, allowing the oil to form slicks around the complex. And on January 13th, they were between 20-30 knots also heading southward. 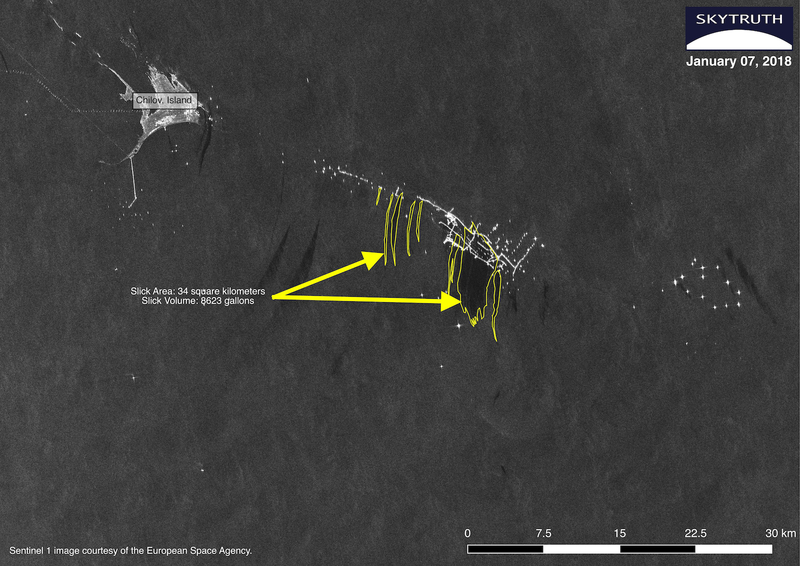 Similar to the image from December 21st, the high wind speeds may have contributed to dispersing the oil. 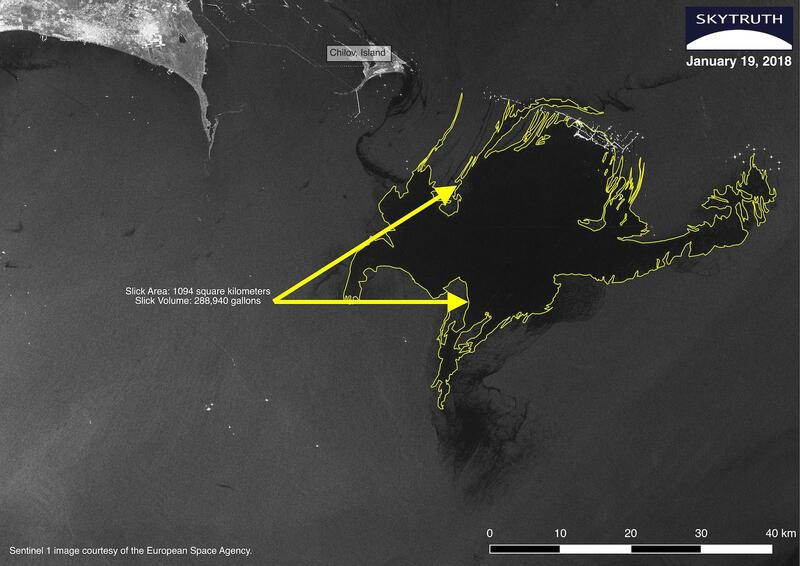 Above: The most recent Sentinel 1 image collected on January 19, 2018 reveals a massive oil slick emanating from the Oil Rocks complex, covering an area of 1094 square kilometers and containing at least 288,940 gallons of oil. For context, 50,000 gallons of oil leaked from the SOCAR#10 platform during a fatal fire in 2015 mentioned above. And this massive Azerbaijani complex has a consistent leaky history on satellite imagery. Azerbaijan, Iran, Kazakhstan, Russia and Turkmenistan, the five countries surrounding the Caspian, all have efforts to tap into the Sea’s 44 billion barrel reserve. But this most recent satellite image from January 19th suggests a troubling future for the environment of the Caspian Sea.